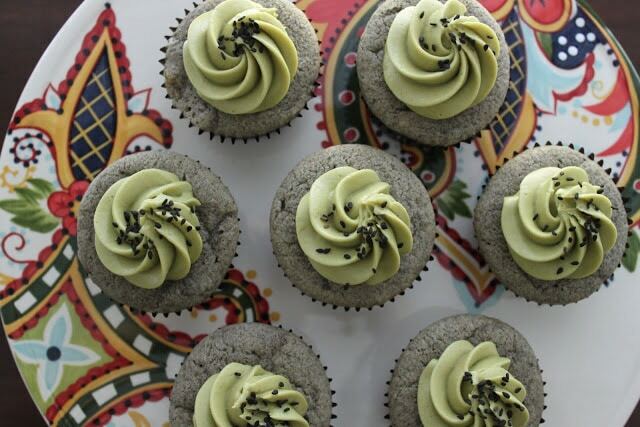 A spin of the classic black sesame and matcha pairing. 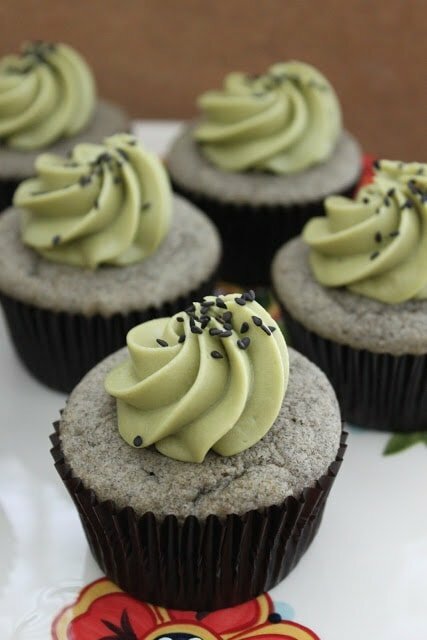 These black sesame cupcakes with matcha cream frosting are a great alternative to the standard birthday treats. In college, I made a ton of new friends and acquaintances. But after graduation, work, distance and life gets in the way and I lost touch with a lot of them. I may have a whole bunch of facebook friends, but I’m sure you can guess how many of those I consider friends in real life. I’m very thankful for the friends I see and spend time with on a regular basis, especially the friends that are always willing to try my new recipes. The friends that think all my desserts are amazing and delicious– those friends are the greatest. And a best friend deserves more than the usual cupcake flavors (chocolate, vanilla, yellow cake). I wanted to make something new, something exciting, something that doesn’t come in a box mix. I usually get requests for red velvet cakes with cream cheese frostings for birthdays (so boring to do and it makes my sink red). 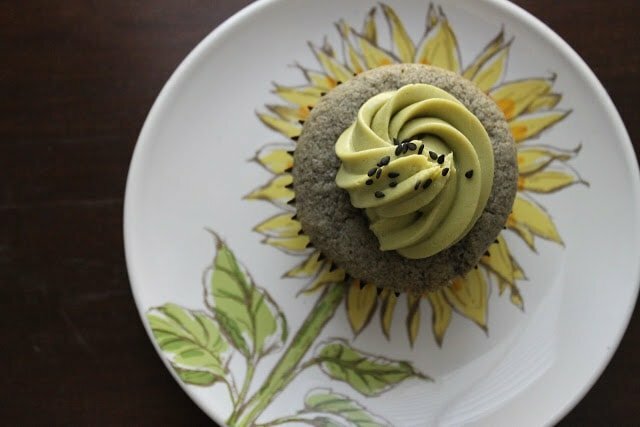 Instead, I thought it would be really fun to try out black sesame cupcakes with matcha cream cheese frosting. Not only are the cupcakes visually appealing, they are just as delicious. 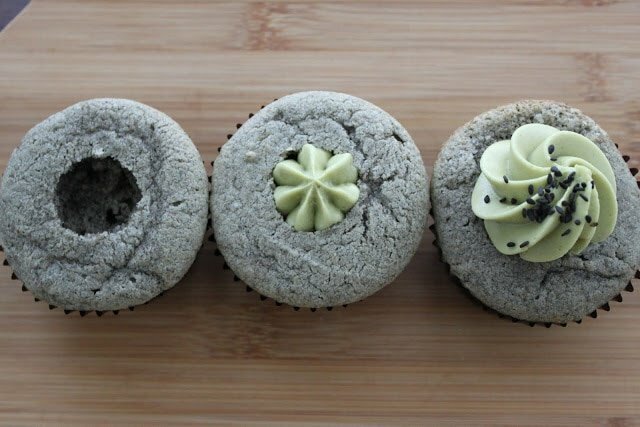 The nutty flavors of black sesame pairs really well with the tart cream cheese and mellow matcha. Plus, the color palate of these cupcakes are more guy friendly. Cream the butter and sugar. Add the black sesame powder, egg, and vanilla paste. Mix until combined. In a separate bowl, whisk together the salt, baking powder and all-purpose flour. Alternate adding flour mixture and milk on low-med speed. Repeat. Beat on med-high for 1 minute until fully combined. Divide batter between 12 prepared muffin tins. Bake for 15-18 minute until skewer comes out clean when inserted in the center. Remove cupcakes from tin and let cool on rack. Begin preparing frosting. Once cupcakes are cool. Use apple corer/melon baller/fat end of piping tip to create a shallow cavity on top of cupcake. Cream butter with paddle. Add confectioner’s sugar and beat until combined. Slowly add cream cheese. Mix until combined. Add matcha powder and beat until fully incorporated. Prepare a piping bag with a medium star tip. Place frosting in prepared bag and fill the cavity until it reaches the top of the cupcake. Pipe a large rosette to cover the hole. Sprinkle the top with black sesame seeds. Store cupcakes in the refrigerator and bring to room temperature before serving. Thes look awesome! Can’t wait to try it out. Thank you! Cupcakes are more like a muffin, but so damn good. I will so make these again but I will probably tweek it a bit to try to get a more cakee-like texture. If I don’t have vanilla paste, would vanilla extract work the same? Would it also be same amount? Thanks! Hi Linda! Yes, vanilla extract in the same amount works just fine in the recipe. Thank you Maryanne!. I made the orange poppy seed mini donuts and everyone LOVED it!. Is there no leavening agent in this recipe? Seems like cupcakes would be dense and not rise without one? I made this almost 3 years ago, so I don’t really remember the texture of the cake. But I do remember it being really tasty. If you are looking for a fluffier cake, you can add 1 1/4 tsp baking powder along with the flour and salt. I made these cupcakes and they were a hit! The only change I made was adding ~2 tablespoons of cornstarch to make the cupcake a lot lighter and fluffier. I’m excited to try your recipe! Where can I find black sesame powder/flour? Thanks! You can find black sesame powder/flour at Asian markets, online at Amazon, or you can make your own by pulsing black sesame in a food processor. Hi! This recipe looks great, and I can’t wait to get started. I want to change the cupcake size into the mini ones, however. How would that affect the amount of time spent in the oven? Thanks! Yes, you will have to reduce the baking time for mini cupcakes.